President Trump’s proposed 2020 budget rubs salt in the wounds caused by the GOP’s 2017 tax law. Not only does it propose that working families pick up the tab for the tax law’s giveaways slanted towards the wealthy and big corporations through funding cuts to Medicare, Medicaid, Social Security disability benefits and other vital public services, but it actually proposes even more tax cuts mostly enriching the already rich. We urge you to publish an opinion piece explaining to readers how the Administration’s tightly linked and equally misguided tax and budget policies help President Trump, the wealthy and corporations while hurting the rest of America. After ramming through his 2017 tax cuts that will cost nearly $2 trillion over 10 years and mainly benefit the wealthy and big corporations, President Trump now wants working families to help cover the cost with huge cuts to healthcare, education, housing and more. Trump’s 2020 budget also proposes another $1.1 trillion in tax cuts mostly benefiting the wealthy, paid for by slashing more services for working families. And by repealing the Affordable Care Act, Trump’s budget provides a hidden $235 billion tax cut for the healthcare industry, including insurers and drug companies, major beneficiaries of the 2017 corporate tax cuts. 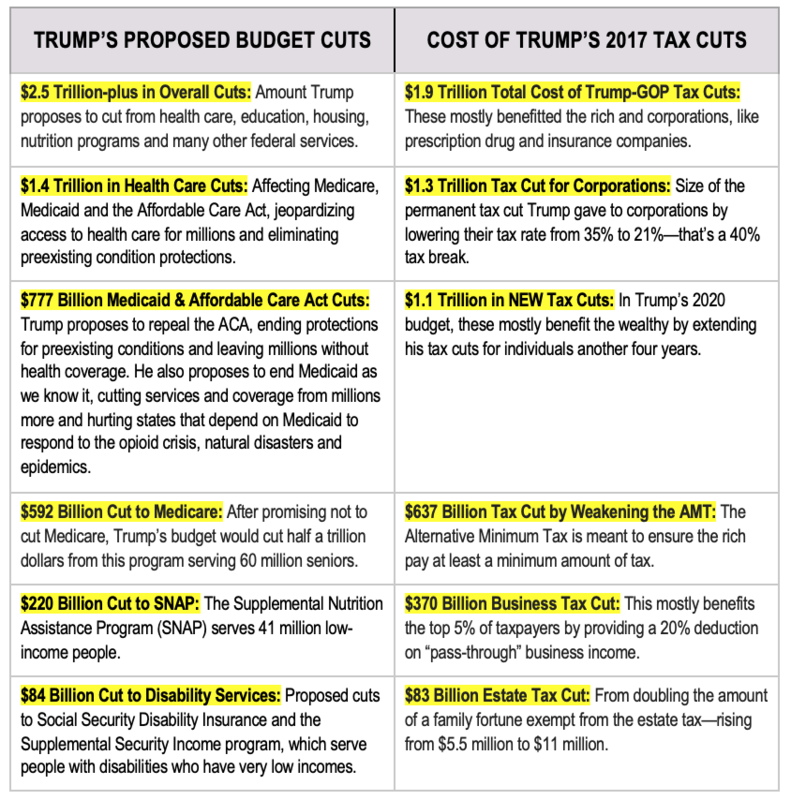 The chart below compares some of the many cuts to key services proposed in Trump’s 2020 budget with 2017 tax cuts of roughly equal size that exclusively or primarily benefit the wealthy and corporations. Presented this way, the inevitable tradeoffs between tax and budget policy become clear. Sources: All dollar figures are over 10 years unless otherwise noted. Sources for budget cuts are at https://bit.ly/2UM1izV. Despite massive cuts to domestic services, the GOP tax cuts along with huge increases in defense spending will result in four straight years of record federal deficits topping $1 trillion each. Proponents of the Trump-GOP tax law, such as Treasury Secretary Steve Mnuchin, claimed the tax cuts would pay for themselves through greater economic activity. The corporate tax cuts in particular show no sign of paying for themselves: corporate tax revenue dropped by one-third, or by $92 billion, from FY 2017—before the TCJA—to FY 2018, according to Treasury Department data. That big drop in corporate tax revenue explains the lion’s share of the $113 billion increase in the federal deficit between FY 2017, when it was $666 billion, and FY 2018, when it rose to $779 billion. President Trump’s 2020 budget shows that he plans to tackle the ballooning deficit due to his tax cuts by slashing Medicare, Medicaid, the Affordable Care Act, education and most other critical services for working families, rather than by reversing the tax windfall he gave to the wealthy and corporations. In fact, he wants to double down on his tax cuts that expire in 2026, by extending them at a cost of $1.1 trillion. Senate Republican leaders have called for similar attacks on services for working families by proposing to slash Social Security, Medicare and Medicaid.